Due to the classic office worker posture, many of our Perth CBD clients present with headaches and migraines. It has been found that the upper 3 joints of the cervical spine – C0/1, 1/2 and 2/3 (between the base of the skull and the first cervical vertebrae (C1), C1 and 2 and C2 and 3) have a direct input to the nerve pathways that send information to the part of the brain that controls head pain and headaches. 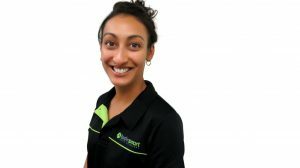 Due to a keen interest in the field of physiotherapy treatment techniques for headaches, one of our Senior Physiotherapists, Laura Saldhana, has undergone further specific training on the diagnosis and treatment of Migraine and Headaches. The course presented current research and evidence which reiterates that headaches and migraines can be caused by dysfunction within the cervical spine (neck) and its surrounding structures as mentioned above. Through treatment of the offending structures and segments, long lasting relief from headaches and migraines has been shown; including a large range and differing types of headaches such as menstrual migraine, tension type headaches and migraines with aura. If you are a headache or migraine sufferer, then it’s worth your while to come and have your neck assessed to see whether this treatment could be of benefit for you. We use safe and effective techniques help restore soft tissue and joint function in the upper neck. Our initial headache consultation is a 40 minute consultation (rather than the standard 30 minute Initial Consultation). As the nature of headache pain is so complex, the additional time in this consult enables the practitioner to properly assess the cause of the headaches and creates a targeted treatment approach, enabling an effective treatment plan to be structured. Get rid of those horrible headaches by booking in for your consultation with Laura Saldanha today or call Bodysmart on (08) 9481-8708.